The wearing of masks in theatres dates back as far as the ancient Greek festivals in honour of Dionysius, god of theatre. When the Romans conquered Southern Europe, they adapted the Grecian love of theatre and the use of masks in plays and celebrations. The Venice Carnival, (or Carnevale) which dates back to the 15th century, is still famous today, attracting visitors from all around the world to the colour and excitement of this ancient tradition and the elaborately decorated masquerade masks. 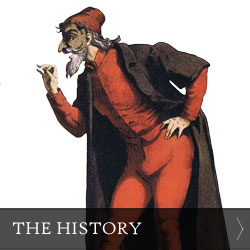 To learn more about the History of Venetian Masks click on this link. 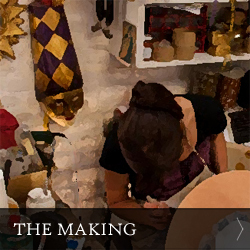 The process of making a Venetian masquerade mask starts with the base mask. It is made using a technique similar to paper maché. It uses few tools, few materials and no chemicals - and the outcome is a base mask that is much stronger than the typical paper maché. All our manufacturers and suppliers of Venetian Carnival Masks are indeed Italian, from the extravagant feather masks to the elegant filigrees. Even with the stalls in Venice itself the market is flooded with counterfeits and cheap imitations. A stamp inside the mask is no longer a guarantee, and even for seasoned veterans the authenticity can be hard to determine. Imitations lack the finesse, the presence of brush strokes and such delicate details of genuine Venetian masks. 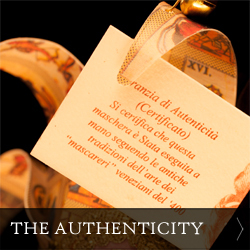 We visit our suppliers regularly, confirming the validity of our certificates of authenticity. Whether is a plain Bauta or Black Feather mask, be sure to get what you pay for.